Last year I made New Year's resolutions and publicly posted them on my blog. I tried to make them reasonable resolutions, but even so, I was a bit surprised that I really was following them when I checked in on them a couple times during the year and again now. Last year I made five big goals for the year, and I really liked how that worked. In fact, I liked that so well that I will be using that strategy again, with some minor tweaks. 1. Play more music. I wanted to play an hour a week, and although I might have fallen a little short, I have improved a bit on piano. I did play a trumpet solo and also with the local orchestra, and it felt so good to play! I also started Desert Boy on piano, with five-minute lessons each day. He's progressed really well, and I hope to continue that into 2014, along with spending about 10 minutes a day on my practice. 2. Exercise regularly. Check. It's definitely harder in the winter, so I did a variety of exercise videos when I couldn't make it outside. This fall I gave P90X a try, and while I liked the workouts, I had a hard time fitting them into my day. Fortunately P90X3 has just come out, with 30 minute workouts, and I'm looking forward to them. In addition, for 2014 I'm not just exercising to feel better and be healthier, my husband and I have also set a goal: climb Mount Rainier in September. To reach the top of this 14,440 foot peak, we're going to have to do a lot of training. I'm looking forward to being in the best shape of my life come September! 4. Eat healthier. We've made good strides in eating healthier. I felt really good this year, and I think a large part of it was having a more natural diet. We have cut out a lot of processed food from our diet. One of our easiest changes was to freeze 100% fruit juice in special containers. When the kids want a special treat, they ask for the frozen juice instead of a popsicle or other packaged food that contains too much sugar and/or artificial flavors or colors. We're going to continue on our journey of eating healthier in 2014. 5. Give more. In 2013 we enjoyed the program We Give Books throughout the year, where we got to read books for free and the organization that sponsors the website gives books away. We also gave of our time in various ways. In 2014, we'll continue many of those efforts, but the one I particularly want to focus on is to give more time to my husband. Specifically, I want to figure out a way we can have one date night a month. That might not sound like much to some, but for us it would be huge. Of course I still have plenty of other things I want to do: read the Bible in one year (I started last year but didn't make it through, maybe this year will be better! ), write more, self-publish a children's book about the Great Basin, spend more quality time with friends, learn a lot more about structural fire fighting and emergency medicine, improve my birding skills, find more ways to enjoy the outdoors with my kids, learn how to raise chickens, take some trips, and keep learning. To name a few. I'm sure I'll find more things to do throughout the year. As I get to know myself better, I find that I feel most alive if I'm learning something new, having an adventure, and sharing my knowledge. I don't want to have such a long list of resolutions that it becomes burdensome, though, so I'll stick to my list of five and everything else that I get done will be a welcome bonus! I'd love to hear some of your resolutions, if you're willing to share, either in the comments or on the Desert Survivor Facebook page. Thanks for being part of the Desert Survivor family. We wish you and yours a wonderful 2014! We hope you have had a good time celebrating the holidays! We've been very busy, despite the long nights and short days (which are thankfully getting longer now that we're past winter solstice). 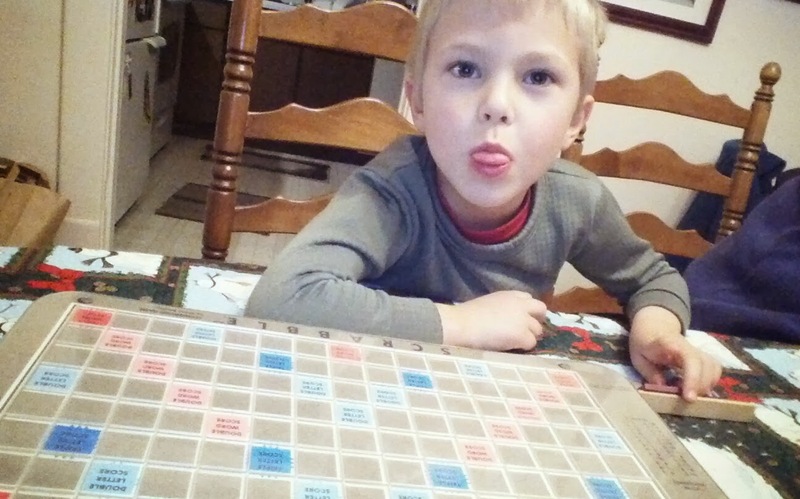 We've been celebrating the holidays with lots of games: cards, battleship, and Scrabble. It's good to see how much these simple games make for good entertainment--and good companionship! As Desert Boy wants to play on electronic devices and computers more and more, I find that I want him to also learn to play the old-fashioned games. We're still figuring out our balance.I remember playing battleship at my grandmother's house, as we didn't have it at home so it was a special treat. Now Desert Boy has the same opportunity, and I think he enjoys it as much as I did. What games do you like to play the best? Desert Boy had a chance to visit with Santa the other night. He wasn't at all shy about visiting him. Desert Boy is definitely a Santa doubter, but he'll go along with it for fun. And there's still a glimmer of uncertainty--maybe, just maybe, Santa does exist, and in case he does, he wants to make the most of it! This last weekend we went to a cookie-decorating event sponsored by the local 4-H club. The kids went right to work. Well, except for Willow, who just enjoyed the atmosphere and smells of sugar. It quickly became obvious that this was very much an art event. Soon the frosting mustaches (and beards) were evident. And why bother putting frosting on the cookie when it can go straight in the mouth? These little friends decorated diligently. How high can a cookie be decorated? Or maybe the question should be how high can it be and still fit in your mouth? Caleb gave a little talk about what 4-H is. Cloverbuds are the youngest 4-H members, and need to be just 5 to join. Warning: the next photos may cause you to gain five pounds just by looking at them. Desert Girl's final creations. Which one would you choose? Desert Boy's decorating. I think he had a theme going on! Here's to a sweet Christmas! I've read a couple of books over the last few months that made me think about how I'm living and how I want to live. Generally, I feel like I'm in a better place in life now than a year ago. I've grown as a person, have better figured out my priorities, and feel God's blessings daily. Nevertheless, there's always room for improvement. In The Happiness Project, author Gretchen Rubin has some great suggestions about how to be happier. Some of the ones that struck me were to declutter, sleep more, don't expect praise or recognition, quit nagging, be silly, remember birthdays, be generous, don't gossip, make new friends, and give something up. She's got lots of great stories and it's impressive how she reads so much and retains so much from that reading and is able to incorporate it into her book. A friend gave me Still Alice by Lisa Genova. It's about a woman who gets early-onset Alzheimer's and proceeds to show her point of view of what it's like to live with the disease. There are good days and bad days, and on the bad days, life is very tough. I appreciated getting to learn more about the disease. The book also showed that even though your existence is going along smoothly, you may get a hiccup in your life that changes it more than you ever thought possible. These two books, along with a variety of blogs I read and talks with friends, have really stressed the importance of living every day to its fullest. Over the past few months, we've had a number of local residents pass away and a number of others get seriously ill. With such a small community, we really feel the impact. No one could have guessed that this December we would be missing so many of our friends. So I want to reach out to everyone I know and give you a huge thank you for being part of my life. You make a difference. And I am working on taking the time to express my gratitude, to live in the moment and smell the flowers and enjoy the smell of those flowers, and to spend my time on things that matter to me. There will never be enough time to do everything, so I might as well do what I really want to do. As I continue on my journey of life, I'm continually looking for advice for living a happy, meaningful life. And advice on good books. Let me know if you have any of either to share! Monday is our annual Christmas Bird Count for this area. It started here in 1997 and has been going on every year since, and it's been interesting learning about some of the trends (which you can see in an article in this publication). Worldwide, the very first Christmas Bird Count was in 1900, which makes this project the longest citizen science project in existence. To get ready, we started putting bird feed in our feeder about a week ago. It didn't take long for dark-eyed juncos and pinyon jays to find it. The pinyon jays come in a huge flock and stay until they eat everything. They are beautiful birds, although a little aggressive so they keep out the other birds. I was surprised by how the photos I took captured them in so many stages of flight. A neighbor's feeder also gets the pinyon jays, but also lesser goldfinches, and at the top, a white-crowned sparrow. To expand the citizen-science aspect of this project, I visited Desert Boy's school and put up a bird feeder for them. They are going to help watch what shows up on Christmas Bird Count day and contribute to the effort. They were fascinated with the binoculars I brought. We also practiced a few bird calls (e.g., Canada goose, mallard, raven, mountain chickadee, great horned owl, red-tailed hawk). I was impressed how well they knew them. Although most thought the red-tailed hawk was an eagle because that's what television dubs in--a real eagle call is rather weird and unimpressive sounding. Then we made bird feeders they can take home with them. First, find a pine cone, tie a string around the top, goop it up with peanut butter, then roll in bird seed. Put in a plastic bag to get home, then take out and hang up outside. The kids seemed to really enjoy it. Hopefully they will see some neat birds at home! If you'd like to help in your local Christmas Bird Count, it's not too late to sign up. They are lots of fun, and you can participate even if you're brand new to birding. Trust me, it's more fun to look at birds for the day than you might imagine! You can also just count birds in your yard or on a walk and submit what you find. We've been focusing on homemade Christmas items this year, and that's been a lot of fun. Desert Boy got a lesson on how to wrap presents the other night. He asked where I had learned how to wrap presents, and I told him "My mom." He said, "Your mom taught you a lot." I agreed. Meanwhile, Desert Girl was enthralled with a craft project putting together gingerbread people made out of felt that allowed her to use glue. Glue is a special treat in our house now, after several glue incidents. It is a carefully controlled substance. Desert Girl was trying hard to make her gingerbread dolls just right. We've also made some Christmas ornaments out of a sticker kit. It's funny how the kids can make even a simple design have some extra character! You can tell that these were kid-made! They will be happy reminders of this stage in Christmases future. We had an extra form in the package, so I let Desert Girl do whatever she wanted, including using scissors. This is what she came up with. Notice the ponytail on the snowgirl. She was very proud of that. I asked him where his club was, and he said he was making it. Once it's ready, I've got an exclusive ticket! Here is one of the finished gingerbread people! I so much appreciate the extra smiles and chuckles the kids share and create! …marvelous, out-of-this world clouds (okay, a little photo editing maybe made them a little more out-of-this world!). I hereby dub the cloud above the dumbbell cloud. Then, after a slow start the next day, the snow started coming and coming. We got several inches down in the valley, and up on the mountain it was over 20 inches. Not only did we get snow, we got frigid cold temperatures. Desert Boy asked if he could walk on the ice, and I told him to go for it. The kids didn't seem to mind. They were on their usual perches at the post office, waiting for the bus. Then the kids decided to play in the snow. In the parking lot (it hadn't been plowed yet). Of course one ended up covered in snow. It's a good thing kids are tough! I liked all the lines in this photo. My drive to work. It was kind of cool seeing the snow getting deeper and deeper. But also a little scary. A dark-eyed junco searching for food in a shoveled area. Can you spot the car? Maybe the windshield wipers that are sticking up? It was quite the snowstorm, and with the temperatures, we'll probably have the snow around for a long time. Fortunately the kids got to go sledding yesterday and take advantage of the snow. The day before Thanksgiving Desert Boy didn't have school, so I took the morning off. Desert Girl had preschool, so I decided that after we dropped her off, we'd head to the nearby sinkhole with a stop at the salt flat on the way. Better yet, we'd take some of Desert Boy's friends. We have a lot of salt flats, or playas, out here in the desert. The rain falls, runs down to a low spot and pools, and then evaporates. It often leaves behind salt. Sometimes the playas are hard and you can drive on them, and other times they are mushy and will cost you an expensive towing bill. The temperature was just below freezing, so I was hoping that it would stay that way. I was a little concerned that if the snow melted it could make the playa just mushy enough that I would get stuck. With four kids. Miles from the nearest person. I told myself if that did happen, it would be an adventure they'd remember. This playa has a dug out spot that collects water. We went over to look for wildlife and found some deep snow and a little ice. I had to work hard to convince the kids not to step on the weak ice. I didn't want our outing to end in the first five minutes due to a soaked, cold kid! Fortunately they listened and soon were running free across the playa. That's one of the best things about a playa. It's a wide, open space, and you can go anywhere you want. While the kids ran, I looked for patterns in the snow and ice. These patterns were quite a bit different from the ones I found in the spring when I visited this same playa. Meanwhile, Henry was busy rolling on the snow. You can see Ava's boots in the photo. She was rolling around too. Desert Boy tried to make a snow angel, but the snow was a little too hard. I found it kind of funny that the kids chose to lay down on a cold surface. We all agreed after awhile that it was time to head to our next destination: the sinkhole. When I had first asked Desert Boy if he wanted to go to the sinkhole, he enthusiastically agreed. "I want to go. We can look for snakes." I smiled inside. Yes, the sinkhole is a major snake haven. But it was winter, and our likelihood of finding snakes was very small. In fact, this was the perfect time to take a bunch of kids there. We parked by the fence and found a place to cross it. Then I had the kids line up for a "before" photo. Soon they were charging down. I had told them as we were pulling up that we were going to the bottom, and none of them argued. They were ready for some outdoor time. The mixture of snow and hard ground made for some interesting falls, but we all made it down unscathed. Then the real fun began: finding snake skins! The snakes shed their skins as they grow, and we found snake skins all over. The kids soon began a friendly little competition to find the most. They all left with a pile of snake skins and big grins. I knew the trip was a success when the next day one of the friends asked me, "Where are we going today?" Soon, my little friend, we will go out again!